The following article was shared with the Institute by its author, Professor Doug Paxton, co-director of the Leadership Center at Saint Mary’s College of California. It addresses yet another critical area for the kind of dialogue called for by Pope Francis in his recent encyclical. I’m a white guy from Kentucky, born as the Civil Rights era began. In my family, there were messages about race that were mysterious and conflicting. We were taught to be good and cherish equality, but we were also taught not to notice or speak about race, ever. Being taught to not see racism was not helpful preparation for living in a multiracial world or understanding what it means to be white. Part of teaching leadership is helping people come together to address tough topics — including race. I know that talking about race can make people uncomfortable (just ask the folks at Starbucks). Engaging in a dialogue on race is not just an exercise in white shame and guilt; such dialogue can help us heal our humanity and open our hearts. After trying to find my footing with race, a “racial reality gap” has slowly become clearer to me. I see how white people and people of color can view the same events (think Ferguson, immigration, housing) and come to strikingly different conclusions. When people of color share their perspectives, it’s through a lens that recognizes how racism is woven into the fabric of our society. And when white people hear those perspectives, we can be surprised and put off by realizing how deeply prevalent racism is in the world. Discomfort arises. Defensiveness arises. Denial arises. As I began to listen to the stories of colleagues of color, I realized they were describing an unfamiliar, parallel universe about which I understood shockingly little. I also learned how painful and depressing it can be for people of color to encounter our denial and see how truly little understanding most of us white people have about the racism that impacts their day-to-day lives. The racial reality gap comes into view, and is larger than we imagined. While avoiding the subject of race was admittedly an improvement over the overt racism of the past, it left me with lots of catching up to do. I have been part of a group of white people who have been exploring what it means to be white for over a decade. We want to understand what it means to be members of the dominating and privileged group in society, and translate our learning into new behavior that helps us be more effective in taking action for social change and racial justice. We want to lean into the discomfort, and the learning. When we began, we noticed our fervent desire to be “good white people” and how that very desire got in the way of seeing our own participation in a racist culture. For example, in seeking to be good white people, we realized it really meant identifying other, more racist (bad) white people, over whom we felt superior. As we sought to be good, we only got there by being better than someone else. We were perpetuating the very phenomenon of superiority we wished to change! We wanted to “get it,” to understand racism better and take more just action, and yet no matter how much we learn, we won’t ever see the systemic racism and privilege as readily as our colleagues of color. The paradox is humbling, and we must get over it. What we learned was it is helpful to have the intention of being good, as long as we didn’t fool ourselves into thinking we were good. Listen, open your heart, and bring patience, compassion and humility for what we don’t know. Follow the advice of Maya Angelou and “believe them; the first time,” when a person of color has the patience and generosity of spirit to share their story with you. Notice and talk about race and privilege with other white people. Learn to distinguish the difference between individual bias and institutional racism. As white people, we have been particularly shielded from seeing the way the system of racism works to maintain the status quo. 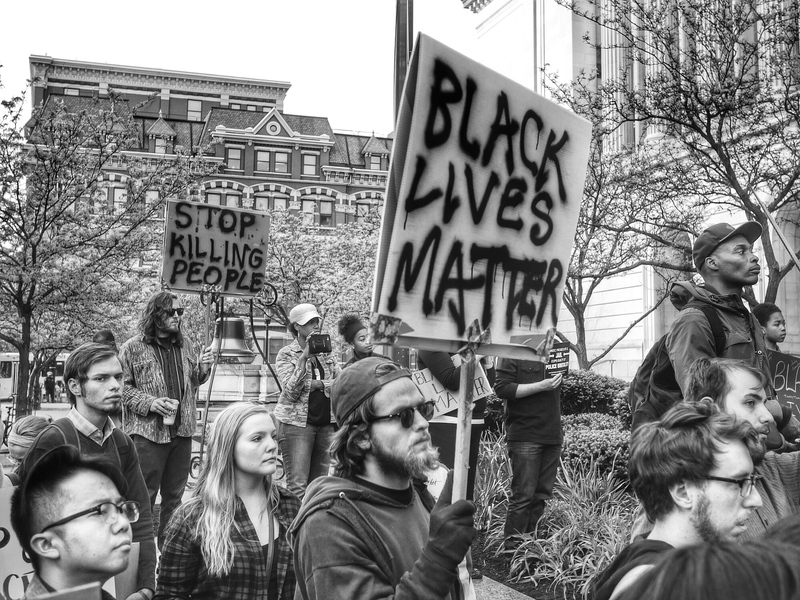 Find out about and take action with organizations such as Showing Up for Racial Justice, a national network of groups and individuals organizing white people for racial justice. These small steps alone won’t close the racial reality gap, which is centuries in the making, but they can help us move in the direction of making the world a more just and loving place. The article was originally published in the San Francisco Chronicle on Sunday, July 19, 2015. Photo credit: https://www.flickr.com/photos/5chw4r7z on Google Images labeled for noncommercial reuse.